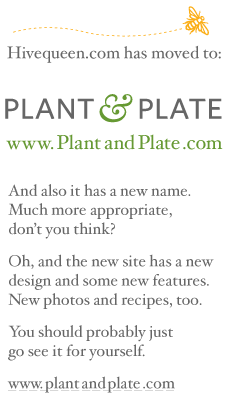 Some time back, I bookmarked a lovely-looking recipe for lemon-braised chicken with white beans and mint pesto. I was planning to make the dish last night, having finally remembered to pick up white beans. This was before I discovered that one of the big heirloom tomatoes on the countertop had quietly gone bad overnight, and the other needed to be used immediately. 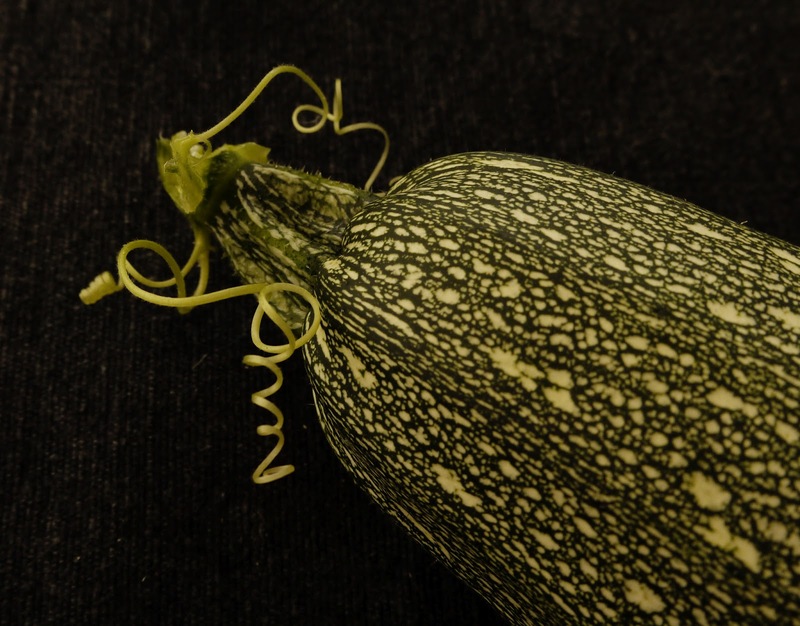 The squash bed, thanks to improved watering and some compost, had several speckled zucchini that were getting to indecent sizes. There were portobello mushrooms in the vegetable bin that needed eating. And somewhat more than half a loaf of Acme Pain au Levain was about to cross over from slightly stale to rock-hard. Also, I'd forgotten to pick up any chicken. 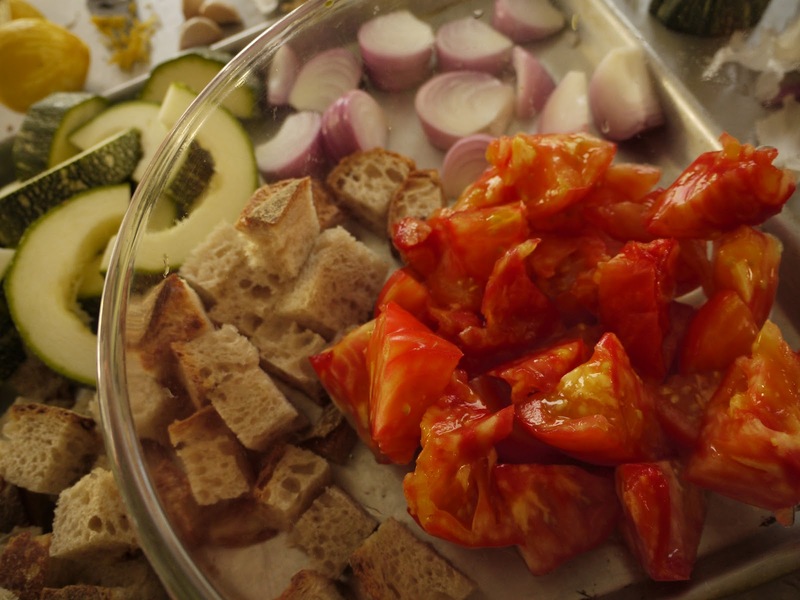 With this many things that needed to be used up at once, I decided to roast the veggies and make a panzanella with the tomatoes and bread. Easy, tasty. 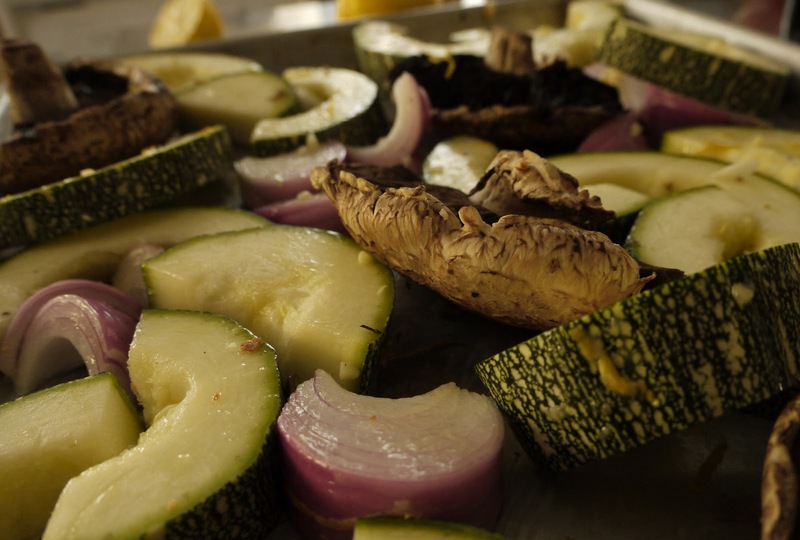 Plus, leftover roasted veggies are great in soup, panini, salads, with pasta, etc. While the veggies were roasting, I made the tomatoes into panzanella, which sounds more sophisticated than "tomatoes and stale bread." I cut the tomatoes into big chunks — even if you're using cherry tomatoes, it's a good idea to cut or smash them to release the juices. Mixed in a little olive oil, salt, and garlic and sprinkled with basil and crumbled feta I had in the fridge. Because I had time, I made the bread into warm croutons; just cut it into big cubes, tossed them with the same oil, salt, pepper, and garlic mixture I'd used for the vegetables, and put them into the oven on a sheet pan for the last few minutes before the veggies were done. Mixing the toasted bread into the tomatoes at the very last second makes for a nice contrast — warm and cool, crispy and soft. 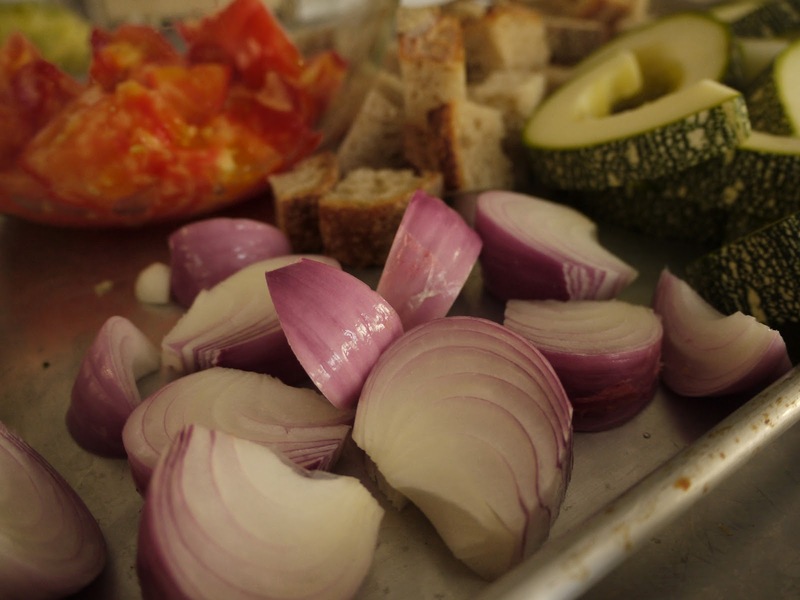 Food photography advice: Don't peel and chop the onions immediately before taking the photos. Particularly if you're hoping to get the straight-above-looking-down shot. Sure, it might have looked great, with the layers and the translucency and the way the light through the kitchen window hits the island, but you'll never know, because you won't be able to see a damn thing.